Passed away peacefully on 12th April 2019 aged 92 years. Loving and devoted Husband of Esma (dec). Loved Father and Father-in-law of Andrea, Tonia and Phil, Jana and Pepe. Adored Poppy of Zelie, Aaron and Paula, Tegan, Michael and Laura, Tiana and Josh, Sophie and Robbie and Tyson. Great-Poppy to Melia. We love and miss you. 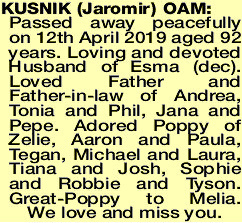 The Funeral Cortege for Mr Jaromir (Mike) Kusnik of Glen Forrest will assemble at the Main Entrance of FREMANTLE Cemetery for a Cremation Service on THURSDAY (18.04.2019) commencing at 10am.